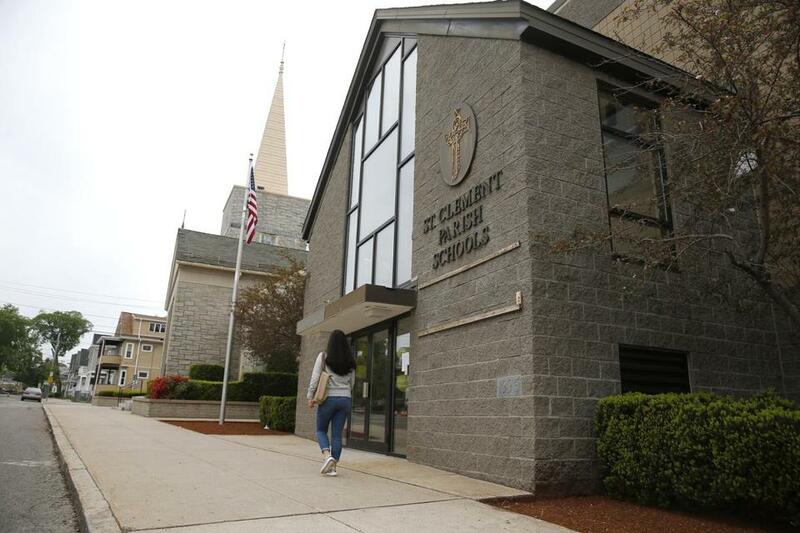 The Archdiocese of Boston has confirmed it is closing the Saint Clement School in Medford. Citing declining enrollment, the Roman Catholic Archdiocese of Boston is closing a Medford Catholic school that opened nearly a century ago. St. Clement School will close at the end of the school year June 9, according to a statement from the archdiocese. St. Clement Parish, which has served the Medford and Somerville communities since 1912, will remain open. The news devastated members of the St. Clement community, said Lorenzo Puccio, 49, of Medford. Puccio, a member of the church’s parish whose daughter graduated from St. Clement two years ago, used to coach the girls’ softball team. Puccio said he believed the Rev. Stefano Colombo, St. Clement’s head of school, was a good priest but lacked the interest or business acumen to solve the financial problems facing the school. The school’s enrollment has declined sharply in recent years, from 256 students during the 2012-2013 school year to 147 this year in prekindergarten, kindergarten, and grades six to 12, according to the archdiocese. Annual tuition is $9,800 for a family with one child attending, but the majority of students are on some kind of financial assistance, Colombo said. The drop in students sparked numerous efforts to jump-start enrollment, but they had little success. School and parish officials brainstormed ideas to increase enrollment, Colombo said. But the only solution that would probably boost the number to a sustainable level would be hiring a full-time admissions employee and a full-time marketing director, which the school couldn’t afford. Terrence Donilon, a spokesman for the archdiocese, said it was not immediately clear what will become of the school campus. The archdiocese and St. Clement officials are working with families of current students to help them enroll in other area Catholic schools. The school will host an informational fair May 31, at which admissions counselors from nearby schools will be on hand. Last year, the school stopped offering class for students in grades one to five at its building at 589 Boston Ave., Colombo said. But the building remains shuttered, with no tenants to offset the cost of maintaining that portion of the campus. The school, which opened in 1925, long served as a neighborhood Catholic school, with a student body consisting mostly of children whose family are members of St. Clement Parish, Colombo said. As enrollment among local residents fell in recent years, international students, as well as children from as far away as Tyngsborough, filled some of that void. But their numbers also dropped in the past five years, Colombo said.